We have been lucky so far this year, no major storms or hurricanes have come our way. Hurricane season is FAR from over, and it never hurts to be prepared. This post is a reprint of one I did last year just before the hurricanes hit. It bears reading again. Portable generators can provide comfort after a hurricane, but only if they are used properly. Please take a moment to read this post to make certain you and your loved ones will be safe. A portable generator is a tremendous asset to have during and after a hurricane when you are likely to be without power. It can provide enough electricity to run critical systems in your home. 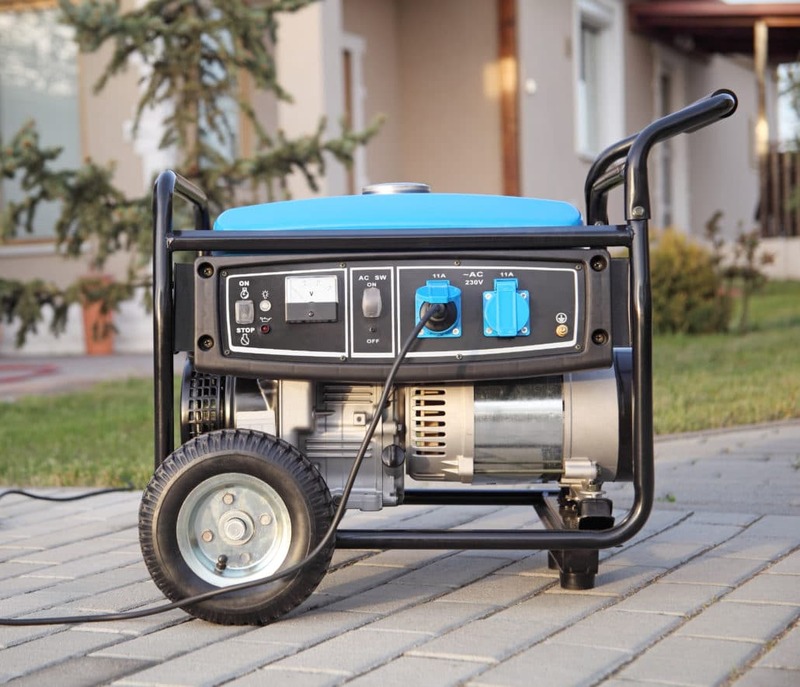 The simplest way to determine an appropriately-sized generator is to make a list of the items requiring electricity you need to have functioning during and immediately after a hurricane. This list might include some strategically place lamps, your refrigerator, and radio which can access a weather channel. Make sure you include any required health-related, or medical, equipment such as a CPAP machine. Once your list is made, contact your local licensed electrician to have him or her determine the total wattage you will need for your portable generator. Generators are measured in kilowatts or KWs. So a 10KW generator produces up to 10,000 watts. 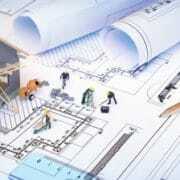 As a general rule of thumb, you don’t want to draw more than 80% of the designed capacity. So if you need up to 8KW your essential electrical needs, you want to purchase a 10KW generator. Why the extra expense of an electrician? You don’t want an undersized generator – which will ideally cause the generator’s breaker to trip when it is overloaded – because you won’t be able to run all your electrical essentials. On the other hand, you probably don’t want to overpay for an oversized, portable generator which will use more fuel and provide more electricity than needed. Spending an hour with an electrician will be worth the additional hassle and expense to get the correctly sized generator. The main danger is that the portable generator – which is capable of generating significant wattage – is then tied into the public utility electrical grid. Electricity will flow down any wire to which it is connected – so if you plug your portable generator directly into your service panel, you are not only supplying power to all the wires in your home which are connected to your service panel, but you are also supplying power out to the public utility grid to which your service panel is also connected (otherwise, you wouldn’t be able to receive any electricity). In 2005, Pike Electric Lineman Ronnie Adams was electrocuted and killed when he spliced a utility line, that had been damaged in a hurricane, that was connected to a nearby home where a portable generator had been backfed into the residential service panel. There are other safety reasons not to backfeed a portable generator into your service panel. For your health, and the health of others, please don’t do it. If you need a generator to feed your service panel, and provide power to your whole house, purchase a built-in, whole-house generator that is properly permitted by your local building department and professionally installed by an electrician. The electrician will ensure all safety features are in place – including the equipment that prevents the generator from backfeeding the public utility grid – and the building inspector will ensure your electrician has done a proper job installing the generator. When connecting your portable generator to any electrical appliance, use one excellent quality (see #3 for more information) extension cord for each electrical appliance. 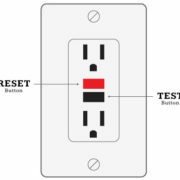 DO NOT run a multi-outlet splitting device from an outlet on the portable generator and connect multiple electrical appliances. Instead, purchase a portable generator that has enough outlets that you can concurrently power all required electrical devices on a one-to-one basis (one outlet from the portable generator connected to one appliance). Make sure you have a sufficient number of excellent quality extension cords to run on a one-to-one basis. Purchase top quality extension cords of sufficient length to reach from the portable generator to the appliance (which may be on the second floor or at the other end of your home). The extension cord should be double-insulated (round) and a minimum of #14AWG wire. Read the label on the extension cords you are purchasing – they are required by law to be properly labeled to include this information. Ideally, you do not want to connect multiple extension cords to reach from the portable generator to the electrical appliance. Plan for a good entry point from the portable generator into your home as you may have hurricane shutters up preventing access. If you have a garage door, with a thick rubber gasket on the bottom, you might run the extension cords underneath. 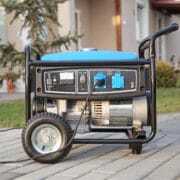 Do NOT bring a portable generator indoors (including the garage) as it omits deadly gasses. Also, be sure your portable generator is SECURED – you won’t want it to become airborne in a high wind. Have a plan for how the extension cords will be routed through your home to mitigate the risk of tripping. One strategy could be to cover the extension cords with heavy enough floor rugs. Taping extension cords to the floor or wall is suboptimal as most types of tape will not hold the cords down, and tape that will (such as duct tape) is likely to leave a gluey mess after a week or two (and hurricanes often leave you without power for multiple weeks). Consider a trial run prior to an actual power outage. This will reduce your stress level in an actual event and it will reduce the risk you have overlooked something that needs to be connected. Consider pets. Nothing makes our dog happier than a nice bone – or power cord – to chew on. Hundreds of dollars have been spent replacing computer cords. Happily, our dog has never been injured by chewing on cords, but it is a real hazard when you are running a portable generator. Make sure your pets are kept in a safe place where they do NOT have any access to the extension cords. A portable generator will not power your air conditioning system since the A/C is powered directly from the service panel. If you need some air conditioning, purchase a portable air conditioner (you will not want to use a window air conditioner during a hurricane). Make sure the portable air conditioner has sufficient ventilation for the heat and that it is on your list for calculation of required wattage for your portable generator. You may want to consider a few portable fans, instead, as these draw less wattage. Your oven/range will most likely not connect to a portable generator because it is a 220 voltage appliance. 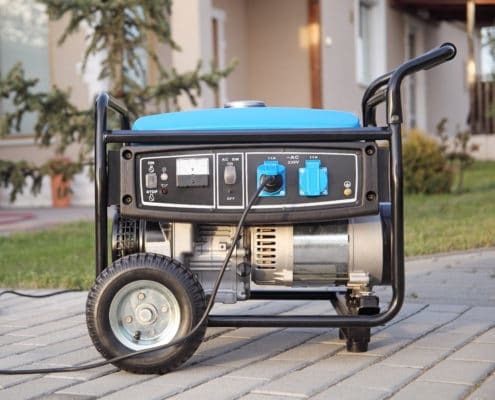 The power supply will not connect to most portable generators. If you need to be able to connect your oven/range to a portable generator, you will need to not only purchase a generator that accepts a 220 voltage extension cord (see pictured 12KW generator at the top of this article), you will need to purchase a special extension cord that has the proper-sized wire, and the correct 220 volt connection, to connect your oven/range to the portable generator. If you need the ability to cook, consider using (or purchasing) a small toaster oven. I do not recommend connecting a microwave since they generally utilize considerable wattage, but if you do plan to use a microwave, make sure it (and the toaster oven) are on your list to be reviewed with your electrician. They will both draw significant power. Your computer will need a surge protector if you plan to connect it (or your phone) to the portable generator. The portable generator power tends to periodically spike, so the surge protector is a necessary safeguard for your computer (see Keeping Your Electronics Safe in an Electrical Storm). I hope these tips are helpful. If you have any questions, please contact me if you have any questions at VeroBeachElectrician@yahoo.com or 772-473-5245. Cliff Ruff is a Master Electrician in Vero Beach, FL.